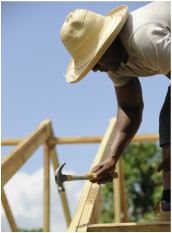 The Building Goodness Foundation is a nonprofit based in Charlottesville, Virginia, that connects volunteers skilled in construction and design with vulnerable communities in the U.S. and abroad. Their focus is building critically needed schools, clinics, homes and centers for economic and ecological development. They have completed multiple projects throughout Haiti, and currently they are working with the Ford Foundation to expand its Secondary School. The Tovar Clinic in Grison-Garde was founded by Bill and Alice White (pictured right) in the early 1980s to provide medical care to the community of Grison-Garde, Haiti. 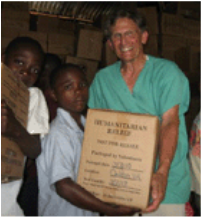 It is now part of the The Haiti Mission, which is supported by the Providence United Methodist Church in Charlotte, North Carolina, the Haiti Mission Foundation, as well as the Ford Foundation. The clinic is Haitian-owned and is open year-round. Four to five times each year, the Haiti Mission volunteers (a team of doctors, nurses and support staff) run the clinic, seeing approximately 3,000 patients per week. Stop Hunger Now is an international hunger relief organization that coordinates the distribution of food and other life-saving aid around the world. The organization is driven by a vision to end world hunger in our lifetime and a mission to provide food and life-saving aid to the world’s most destitute and hungry in the most sustainable, efficient and effective manner. Stop Hunger Now’s meal packaging program provides volunteers the opportunity to package dehydrated, high protein, and highly nutritious meals that are used in crisis situations and in school feeding programs for schools and orphanages in developing countries around the world. 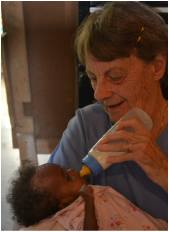 After many years of research, Dr. Patricia Wolff, a Haiti Mission team pediatrician, developed a recipe for nutritional supplements, which she brought to the Tovar Clinic in Grison-Garde, for the treatment of malnutrition in hundreds of children. 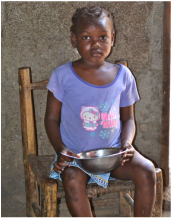 This "Medica Mamba" (peanut butter medicine in Creole) is particularly effective in children with kwashiorkor - a serious protein deficiency. Tilt-A-World builds community-sized playgrounds for orphanages and feeding centers around the world. Why playgrounds? Because children deserve to laugh and play and their mission is to give them a safe place to have fun. Tilt-A-World has teamed with architects, builders and manufacturers to create a very efficient building process. Because of this, they are able to build playgrounds for approximately $5,500.00, with some variation depending on the destination country.